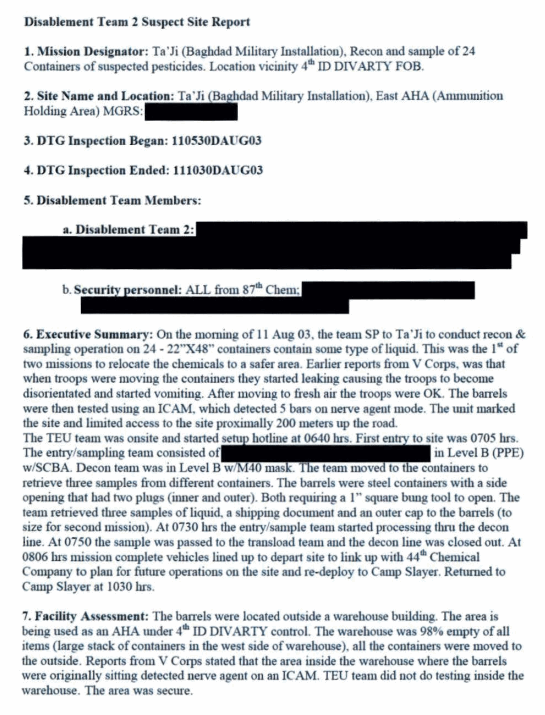 The two-page 2003 Camp Taji Incident report — released a dozen years after the dangerous exposure. The Defense Department is telling soldiers that were exposed in 2003 to a “chemical unknown” in Taji, Iraq that it has no documents on the incident – after a decade of saying that documents on the event were classified. Now, according to reporting by Samantha Foster at the Topeka Capital-Journal, the Army is telling soldiers like Army Spc. Sparky Edwards and former Sgt. First Class Dennis Marcello that there are no documents on the chemical they were exposed to or the incident. Nate Jones, the Archive’s FOIA project director, notes that the DOD may be claiming to have no documents because they were possibly destroyed or misfiled during the war – or because the large, decentralized Defense Department genuinely doesn’t know where to look to find the records. Jones identifies this as a prime example of why FOIA requesters “must specify exactly where they want to search or risk the agency not going the extra mile” to find them, and that it is always a good idea to appeal a “no records” response. According to Department of Justice statistics, last fiscal year an obscenely high 130,113 FOIA requests (16.9 percent of requests processed) were deemed to result in “no records” responses. As the Archive has learned, more often than not, appealing a “no records” response and explaining why you think the records exist and even suggesting which records (including the Washington Records Center –control f) the agency should search leads to more records being found. 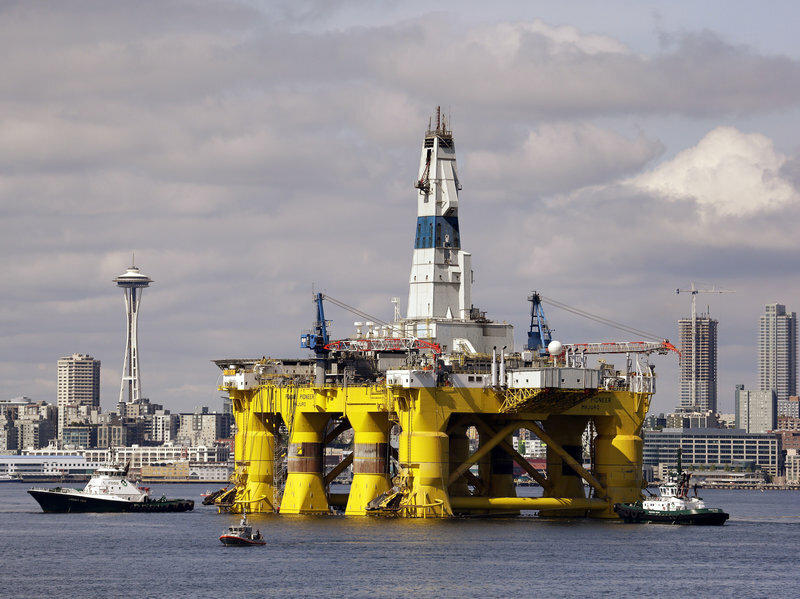 A Shell oil drilling rig. The countdown to FOIA’s 50th anniversary this July 4th has begun. To celebrate, OpenTheGovernment.org is spear-heading a campaign that will highlight the importance of FOIA, “while promoting the passage of meaningful reform legislation that now has the potential to become law by the time the statute turns 50 in less than two months.” This week OTG is promoting FOIA success stories; featured successes include Interior Department FOIA releases showing that big oil is abandoning billions in Arctic drilling rights, and the National Security Archive’s Cyber Vault, which is filled with FOIA-obtained documents on US cyber policies and activities. Next week OTG will partner with MuckRock to highlight technical advances that can improve the FOIA. The preservation of the Senate’s report on the CIA’s Torture Program is increasingly in doubt; the DC Circuit Court of Appeals recently affirmed the District Court’s ruling that the report “is a congressionally generated and controlled document that is not subject to disclosure under FOIA.” Days after the appeals court decision, news broke that the CIA Inspector General’s office “accidentally” destroyed its copy of the report. The recently revealed destruction allegedly took place last summer – months after the CIA’s IG, David Buckley, resigned. Before his resignation Buckley issued a report finding that five CIA officials improperly monitored Senate Intelligence Committee staff working on the Torture Report; while his report admonished the involved officials, the agency opted not to punish them. A CIA panel handpicked by Director John Brennan, “in what was widely seen as an embarrassing rebuke to Buckley,” went so far as to clear the officials of any wrongdoing, concluding that the officials had acted reasonably in the face of a potential security breach. The Obama administration has yet to nominate a permanent replacement. The Defense Department has updated several doctrinal manuals. Steve Aftergood highlighted the updates in a recent blog, noting that the DOD has upgraded its manuals on the use of biometric data and the military and intelligence applications of that data, as well as its manual on the challenges of mountain warfare and cold weather operations. Yet another document featured in the post is an Air Force publication covering offensive and defensive space operations. 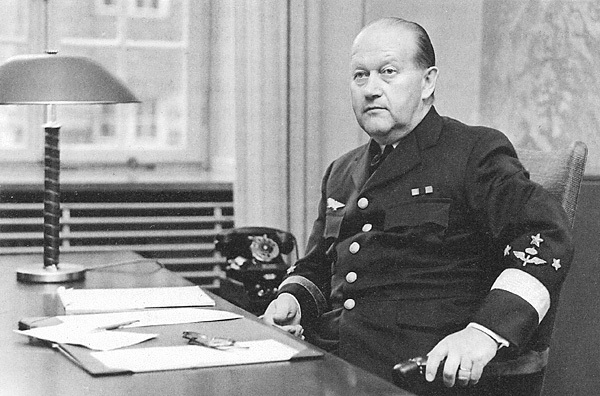 General Torsten Rapp, Supreme Commander of the Swedish Armed Forces (1961-1970) made persistent efforts described by INR to secure funds for nuclear weapons research during the mid-1960s. Recently declassified State Department intelligence reports –posted by the National Security Archive – illuminate a range of important questions about nuclear weapons in world politics during the 1950s and 1960s, including whether new nuclear weapons states would raise the risks of nuclear proliferation. Highlights from the 28 documents published in the posting include: the first comprehensive U.S. government report on the problem of nuclear proliferation, prepared by INR in May 1957, covering possible developments in Europe, Latin America, South Asia, and East Asia; Swedish debates over whether to develop programs for nuclear weapons; and West German opposition during early 1967 to details of the proposed Nuclear Nonproliferation Treaty. The reports also address Indian nuclear capabilities, the Chinese nuclear missile program, French nuclear weapons developments, Soviet strategic decisions, the Soviets and nuclear nonproliferation negotiations, Japanese nuclear policy, nuclear forces in Western Europe, and European reactions to anti-ballistic missile programs. An ex-CIA officer recently claimed to have tipped off South African authorities on Nelson Mandela’s location, leading to his 1962 arrest — and subsequent 27 year prison sentence. The admission reignites a fierce debate about the extent of the agency’s involvement in the arrest. The National Security Archive’s work on South Africa includes reporting on our blog concerning the United States’ South Africa policy at the time of Mandela’s arrest, and coverage of Ryan Shapiro’s FOIA lawsuit to reveal USG involvement in the arrest. Other highlights include our digital South Africa collection (South Africa: The Making of U.S. Policy, 1962–1989), which provides a contemporary record of changing US responses to historical events in South Africa from the time of Mandela’s arrest in 1962 through 1989. 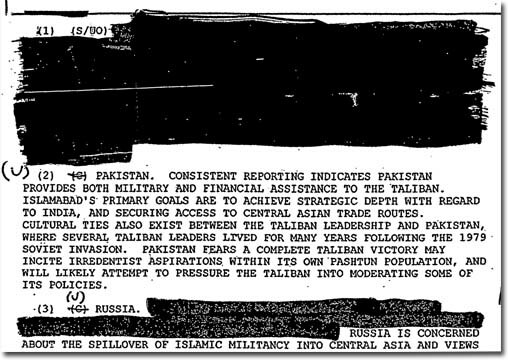 Unnamed and undated, this U.S. intelligence document confirms that Pakistan is providing the Taliban with both financial and military assistance.